She stands in the hall, unseen, unheard. Like a child. Frightened with no reason. Intimidated by no-one but herself. Swallowing back tears and trying, painfully, to somehow stuff down the fear. He sits, still and silent. He knows she’s there, just out of sight. He wishes he had whatever it is she needs to open up and let him see. If he goes to her though, she will run. She will smile and pretend. He knows her. He’s seen her do it a thousand times. 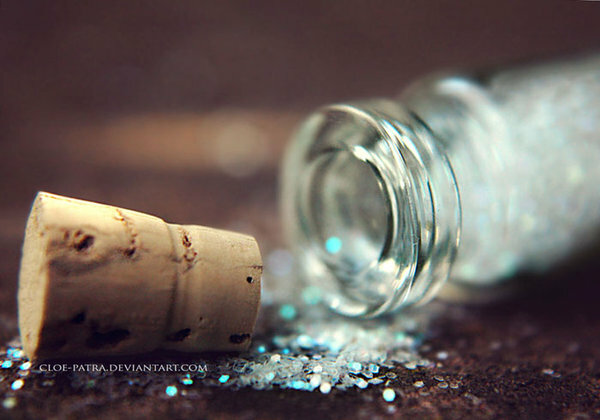 He understands why she locks herself in a bottle, because he does it as well. If he pushes, the cork will become wedged, and nothing will budge it until the pressure becomes too much. Only downward force could change that. He knows that’s exactly what she’d like him to do. To drill out the cork, smash her bottle, force her open. But, he cannot bring himself to break her. She needs to open on her own. To release the cork from within. To surrender without coercion. He watches quietly as she rounds the corner. She glances up at him, making her way quickly into the room, but pulling her gaze down as she kneels before him, and lays her cheek on his knee. He sits for a moment, wishing he had all the answers, wondering if he’ll ever understand his girl. His sweet wife. Remembering her need for his touch, his hand lifts to stroke her and his fingers slip into her silky tresses. She sighs, and her body relaxes. He moves his other hand to shift her so he might see her face. As he does, he watches a tear escape and brushes it away with his thumb. He stares at her and she gazes up at him, into his eyes. She remains mute, but he knows. He sees her. “Thank you for not hiding,” he whispers as his fingers weave through her hair. She exhales slowly, and her eyes clear. Perhaps this is all she needed. His patience will help her find her voice. They are, after all, the same bottle. Just with different contents. Undoubtedly, he will find a way to return her true smile. His way. He knows her, knows what’s under the cork. He sees her, even if the glass is cloudy. He feels her surrender. And eventually, he will find a way to properly use it. To combine the contents of their bottles. To become one. He’s sure that is what she wants more than anything. To be part of a whole, to be part of him. If she can stop hiding, so can he. And perhaps he can break both of their bottles, permanently. Smiling. Yes. This captures so much. Hand squeeze. You must be in my brain too. This was lovely. And is why I hide in the mist. We shouldn’t hide. The only thing we are hiding from is joy! Thank you. As always, my friend, you make me believe it. Wow–do you have a way with words and imagery. Very well done, Mel!